J has been after me to make smoked potatoes, which we discovered recently at a restaurant that I can't remember. Last night I made them, using the tried and true recipe that I got from Laura Calder and eight minutes in my Cameron stove-top smoker. The potatoes spurred me to fill out the menu with Caribbean Jerk Pork Chops, rubbed with a jerk paste and, again, smoked in my stove-top stuffer. The sauce is from Big Bob Gibson, the procedure is the product of experimentation by yours truly. 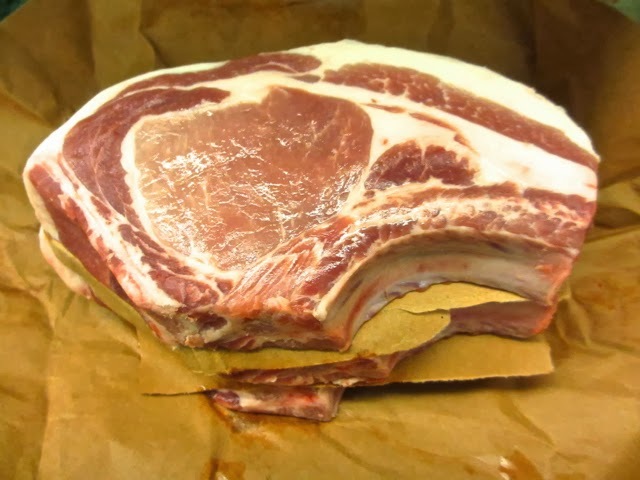 It's easy to dry out pork chops, especially when smoking them, so it's important to find moist ones with some fat. The other approach - brining them - helps but does not produce the rich flavor that rendering fat produces. I made the trek to the Essex Market to find chops at Heritage Meat Shop (the retail space of Heritage Farms), and was rewarded with these gorgeous Tamworth chops. Now it was just a matter of rubbing them with the jerk sauce, smoking them and finishing first in the oven and then under a broiler. Here's the result, with the potatoes and some sauteed zucchini; not a great picture, I'm afraid, but the tastes were there. 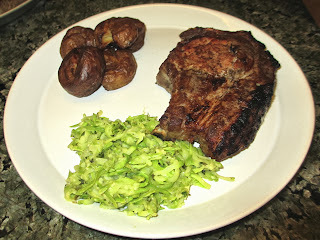 The accompanying jerk-spiced barbecue sauce tied the plate together a bit and brought the chops to life.